From time to time we take part in ‘Multi-Agency Training Days’. 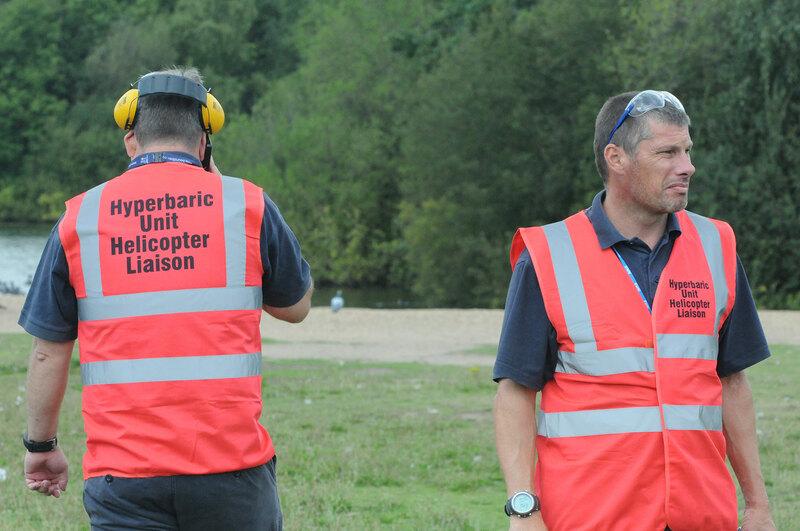 These are full-scale tests of our systems and processes; they help ensure that the various agencies involved can effectively co-ordinate the response to different emergencies. The day started with a call from a Police Dive Supervisor advising us of an incident; one of their divers had a rapid, uncontrolled ascent from a depth of 22 metres. Decompression Illness treatment was required quickly; the Police had informed the Coast Guard and a Sea King helicopter had been dispatched for pick-up. This call was received by the Duty Supervisor at London Hyperbaric Medicine based at Whipps Cross University Hospital. 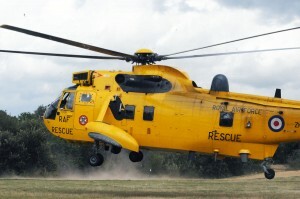 Seaking landing in Epping Forest. The police need to be contacted as they are responsible for crowd control at the landing zone (LZ) in Epping Forest; this is a public area that’s well used during summer months with picnicking families. Epping forest rangers will open up the locked gates around the area to allow access for the ambulance and police, they also help with clearing the area. The hyperbaric crew need to be mobilised to get the chamber ready to receive the patient. This all needs to be done in a very short space of time; a Sea King helicopter can fly from the South coast to the LZ in about 30 minutes. The whole exercise can be stressful but also very rewarding when everything goes like clockwork just as it did on this day. The outcome was that the patient was transferred efficiently with no problems and minimal disruption. Sharks have been roaming our oceans for millions of years. But will they still roam our oceans in 50 years from now? Fisherman have been harvesting sharks like it was corn from a field whiteout any reluctance. Now we came to a point that many sharks species are endangered and on the brink of extinction. Luckily governments all over the word are waking up and bills are being passed to save sharks from extinction. Now we need to educate younger generations that sharks are not brutal men eaters and that a living shark is worth much more than a dead shark. Many people still believe that sharks are a threat to humans, but they forget that vending machines kill more people every year in the US. We humans are a threat to sharks though and if we keep killing them we will take down a whole eco system which we so much rely on. Please share and help preserve sharks for future generations. Orientation.– Does the diver know name and age? Location? What time, day and year it is? Note: even though the diver appears alert, the answers to the question may reveal confusion, so do not omit them. Eyes. – Have the diver count the number of fingers you display using 2 or 3 different numbers. Check each eye separately and then together. Have the diver identify a distant object. Tell the diver to hold his head still, or you gently hold it still, while placing your other hand about 18” in front of their face. Ask the diver to follow your hand with his eyes. Move your hand up, down, side to side. The divers’ eyes should smoothly follow your hand and should not jerk to one side and return. Check pupils are of equal size. Note: Often AGE victims have different dilation in one eye than the other. Also look for Nystagmus (fluttering of the eyes either vertically or horizontally). This is a sign of neurological problems, with vertical fluttering being associated with more severe damage. Face. – Ask the diver to whistle. Look carefully to see that both sides of the face have the same expression while whistling. Ask the diver to grit his teeth. Feel the jaw muscles to confirm that they are contracted equally. Instruct the diver to close their eyes while you lightly touch your fingertips across the forehead and face to be sure sensation is present and the same everywhere. Hearing. – Can be evaluated by holding your hands about 2 feet from the diver’s ears and rubbing your thumb and finger together. Check both ears, moving your hand closer until the diver hears it. If the surroundings are noisy (i.e. : a crowed beach), the test can be difficult to evaluate. Ask bystanders to be quite and turn off unneeded machinery. Swallow reflex. – Instruct the diver to swallow while you watch the Adams apple to be sure that it moves up and down. Tongue. – Instruct the diver to stick out their tongue. It should come out straight in the middle of the mouth without deviating to either side. Muscle strength. – Instruct the diver to shrug the shoulders while you bear down on them to observe for equal muscle strength. Check the divers arms by bring the elbows up level with the shoulders, hands level with the arms and touch the chest. Instruct the diver to resist while you pull the arms away, push them back, up and down. The strength should be approximately equal in both arms in each direction. Check leg strength by having the diver lie flat and raise and lower the legs while you gently resist the movement. Sensory perception. – The divers eyes should be closed during this procedure. Check both sides by touching as done on the face. Start at the top of the body and compare sides while moving downwards to cover the entire body. The diver should confirm the sensation in each area before you move to another area. Balance and coordination. 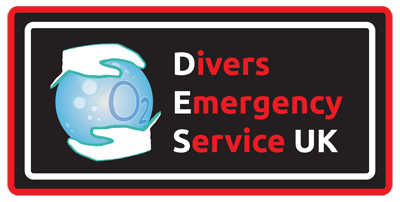 – Be prepared to protect the diver from injury when performing this test. Have the diver stand with feet together, close eyes and stretch out arms. The diver should be able to maintain balance if the platform is stable. Your arms should be around the diver, but not touching the diver. Be prepared to catch the diver who starts to fall. Note: If the diver is already messed up you may want to avoid this one. If he can’t stand check coordination by having the diver move an index back and forth rapidly between divers’ nose and your finger held approximately 18” from the divers face. Instruct the diver to slide the heel of one foot down the shin of the other leg. The diver should be lying down when attempting this test. Check these test on both legs and observe carefully for unusual clumsiness on either side. Remember to note all your findings. When it comes to wreck-diving, UK is probably one of the best dive destinations in the world. With thousands of ship wrecks scattered all across the isles, there is always a wreck an avid diver can explore in every known dive destination in the Kingdom. Some sites offer even more scenic spots and unique animal encounters under water that no other destinations can provide. Here’s a list of the top 7 dive sites in the UK. Weymouth has more than 120 wrecks within a 20-mile radius. The wrecks include warships, submarines, steam ships and freighters, among others. The most popular are the M2, the Salsette, the Avalanche, and the Aeolian Sky. Situated in the centre of the Jurassic Coast World Heritage Site, the area has an abundance of reef and ledge dives and are home to an amazing variety of marine life. Plymouth is where experienced divers often explore the wreck of the HMS Scylla, a Leander-class frigate, sunk as an artificial reef in 2004. Also visible is the James Eagan Lane, a US Liberty ship that was sunk by a U-boat in World War 2. The area also has a smattering of shoals and reefs, in case divers opt for a change of scenery. Located on the eastern side of the Lizard Peninsula, the Drawna Rocks in Porthkerris boasts of the best shore dive in England. Just a short ride to nearby Manacles are numerous wrecks such as the Mohegan, the Volnay and the Spyridion, among others. Apart from the wrecks are pinnacles, drop-offs, reefs and an abundance of marine life. During the months of May to August, Porthkerris is visited by the second largest shark in the world, the Basking shark. This is a marine reserve with a sharp drop-off that goes down to 45m. It is the site of the Lucy, a 52m intact coaster that sunk perfectly upright in 40m of water. It’s also home to frolicking grey seals, rare gorgonian fans (found in only a handful of areas in the UK), and various crustaceans. Located in the southwest of the Isle of Man is the islet Calf of Man, which hosts a dive site called the Burroo. This is rated as one of the top 50 dive sites in the world. Due to the strong tidal currents in the area, the marine life is abundant and diverse and may possibly be the best in all of the British Isles. There is an intact wreck of a Manx trawler, the Fenella Ann. Other wrecks worth seeing are the Ringwall, SS Liverpool and the Thracian. There is also an interesting cave worth exploring in the nearby Sugar Loaf dive site. This area is famous for its colony of 5,000 grey seals that often accompany divers. It offers scenic wrecks such as the Somali, Chris Christianson, Abyssinia, and Britannia. It also has a pinnacle, a wall, some reefs and rocks covered with soft corals and a huge, deep-water anemone, the Bolocera. This is a natural harbour offering the best wreck diving in the UK. In the area are three battleships: the Markgraf, the Kronprinz Wilhelm and the Konig; and four light cruisers: the Coln, the Brummer, the Karlsruhe and the Dresden. These are popular wrecks among the 52 ships of the German High Seas Fleet that were scuttled near Cava at the end of World War 1. Due to their sizes, it usually takes several dives to view and appreciate just one wreck. Aside from these Dreadnoughts, there are also several wrecks of fishing boats, trawlers, cargo ships and a host of others scattered all over the harbour. Divers will have their calendars full just navigating these 7 spots in the UK. There isn’t a lack of places to explore, and definitely not a shortfall in exciting things to see. If you’ve spent the summer diving and find your gear needing some kind of an upgrade, now is probably the best time to buy. Too late for summer yet too early for next year’s dive season, you can upgrade your gear with this year’s current prices now, and be ready for next year’s season with brand-new equipment. Here are some of the latest goods that manufacturers have put out for 2013. If you like exploring, going deeper and staying longer underwater, or maybe even considering doing some technical diving, a number of recreational and technical BCDs have been put out to address those requirements. The options make the transition from heavy recreational diving to light technical diving much easier, since you would no longer need to keep two sets of BCs. These rec/tec BCDs can be rigged to accommodate 2 cylinders, have at least 40lbs. of buoyancy lift –great for keeping you afloat comfortably even with an extra-heavy load – and come with more heavy- duty D-rings for attaching various accessories like a survive-balloon, flashlight, reel, slate, etc. Moreover, they’re made with tough, durable material that can withstand very rugged use. Some of these are the Apeks Black Ice, Oceanic Probe HLC and the Tusa BCJ-8000 X-Wing. We all know the feeling of finding our drysuits unable to withstand the stress of wear and tear – a puncture here, a laceration there, or any kinds of minor abrasions in the most unexpected places. Imagine a leaking drysuit causing problems with your buoyancy! Knowing this, manufacturers have come up with drysuits made of specialized heavy-duty material that can withstand all kinds of stress. Companies like Bare have incorporated a high-tenacity nylon/butyl/polyester tri-laminate in its Trilam Pro Dry model; Waterproof USA’s D7 tri-laminate body is covered with an outer shell made entirely of Cordura; while USIA is playing around with nano-composite materials, creating a composite fabric that’s supposedly 15 times stronger than steel and 40 percent tougher than aramid fibers like Kevlar and Nomex — yet still lightweight and flexible. All these promise to give you years of trouble-free diving. Everyone knows LED lights provide the punch of a high-wattage lantern with only a minimal power requirement but with a longer lasting battery life. Manufacturers are now coming out with smaller-sized units, small enough to fit into BC pockets but strong enough to be a primary light source during night dives. Such is the Ikelite Vega . It provides the convenience of bringing a single flashlight both for day — lighting holes and crevices – as well night dives. The Under Water Kinetics Aqualight E-LED on the other hand has adjustable light beams that can double up as a fill light, a spot light or focus light, or a floodlight for underwater video or still photography. Lastly, SIZE AND WEIGHT still do matter . In 2012 we saw innovations for smaller and lighter gear. This year, the trend continues. More and more divers travel worldwide, so the demand for lighter, more compact equipment continues to be addressed. Meanwhile, we in the dive community have never had it this good. Marine life in tropical waters that pose hazards to man can be divided into four general categories: Contact irritants and toxins, Injected toxins, Ingested toxins and Predators . This month I will cover contact irritants and toxins. All these animals possess nematocysts, a stinging apparatus that discharges on contact. Floating tentacles can retain active nematocysts, even after drying and there is a wide range of toxicity, from mild to severe. Symptoms: Rapid onset of pain, varying from mild to severe. The rash is red, hot and swollen, usually linear. There is frequent pustule and vesicle formation and severe stings may cause muscle cramps, abdominal pain, fever, chills, nausea, vomiting, respiratory distress, and cardiovascular collapse. Fatalities are increased if there is pre-existing cardiac and respiratory disease. Box jellyfish (aka chironex, irukandji or sea wasp) may cause death in healthy individuals in less than 15 minutes. Treatment: Use topical vinegar to neutralize undischarged nematocysts or sea water if copious volumes of vinegar are not available and then removal of remaining tentacles. Apply topical analgesics and steroids or intravenous versions if available. Treatment for shock or cardiac arrest may be required and therefore monitoring of pulse and blood pressure is required. Box jellyfish anti-venom is not universally available at all dive sites or smaller hospitals or clinics. Avoiding box jellyfish contact is of paramount importance. When diving in remote resorts in south-east Asia it is wise to ascertain the availability of anti toxin. This is the only known venomous starfish, its arms having large spines with venom producing integument. Symptoms: Rapid onset of swelling, redness and pain. Cleanse the wound and apply topical antibiotics. Give tetanus protection. Multiple slender spines puncture the skin and break off. Symptoms: Immediate pain, joint pain, swelling and numbness. Treatment: Remove spines, cleanse, topical antibiotics and tetanus protection. Soaking in hot water for 60-90 minutes is said to offer relief from the pain and swelling. Surgery is indicated for a foreign body reaction and if a joint capsule is punctured. Topical antibiotics and tetanus protection should be offered. Some species eject a visceral liquid. Symptoms: Redness, itching and pain. If eyes are involved, symptoms are similar to chemical burns and blindness can occur. Treatment: Copious irrigation of the affected area. Three species of sponges produce a rash on contact, including the red-beard sponge, fire sponge and poison-bun sponge. Symptoms include: redness, joint pain and swelling. Treatment: symptomatic with soothing lotions and topical steroids. Coral may cause abrasions that become infected but there are no toxins associated with coral. Fire coral is not actually coral. It has nematocysts and is more closely related to jellyfish. On close inspection, fire coral has tiny hair like tentacles, unlike coral. Question 1: What is shock? Shock is a medical term for poor organ perfusion. The casualty looks pale, has a weak pulse, low blood pressure and may be drowsy or confused. There are many causes of this, but severe decompression sickness, arterial gas embolism, severe bleeding or anaphylaxis are the likely causes in divers. The treatment requires intravenous fluid resuscitation and needs medical support urgently. Question 2: What is anaphylaxis? Anaphylaxis is a life threatening reaction which is rare but can occur due/ as a result of to medications, commonly penicillin or stings, such as bee stings. Therefore it is possible to have an anaphylactic reaction to any of the above sea animals. The symptoms come on within minutes of exposure and include wheeze, itching, redness, confusion, drowsiness and shock. Question 3: How do I treat anaphylaxis? Question 4: How do I avoid getting stung? Find out about the dive site beforehand. Jellyfish appear seasonally and most others are rooted to the spot or at least move slowly. The best plan is not to touch anything but a thin wet suit is very effective at preventing stings. Be careful when it comes to washing the suit afterwards, as the nematocysts will still be active! Question 5: What is Irukandji syndrome? Irukandji syndrome is similar to anaphylaxis and is produced by a small amount of venom from a box jellyfish. There are muscle cramps, severe pain, a burning sensation in the skin and face, headaches, nausea, restlessness, sweating, vomiting, an increase in heart rate and blood pressure, and psychological phenomena such as the feeling of impending doom. The syndrome is delayed for 5–120 minutes and the treatment is symptomatic, with anti-histamines and anti-hypertensive drugs used to control inflammation and high blood pressure; intravenous opiates are used to control the pain. Irukandji are usually found near the coast, attracted by the warmer water, but blooms have been seen as far as five kilometres offshore. When properly treated, a single sting is normally not fatal, but two people in Australia are believed to have died from Irukandji stings in 2002. If you like this blog, come and join us on facebook – click here!!!! As a diver, clearing your ears may be second nature. However we all had to learn at some stage and damage to your ears from over forceful clearing techniques is possible. So a quick reminder of the many techniques available may be useful. Question 1: Who was Valsalva? He was a 17th Century Italian anatomist, who described this method for expelling pus from the middle ear through a perforated ear drum. Can I cause a perforated ear drum by clearing my ears too hard? Can I use decongestants to help clear my ears? Definitely avoid these and do not dive if you cannot clear your ears. If the medications wear off, the ‘reverse block’ may cause barotrauma, intense dizziness and prevent ascent due to pain. How can I be sure that I am clearing my ears properly? Practise gently in water and follow the advice from your instructor. If clearing your ears is still causing pain, avoid diving with an upper respiratory infection. Try descending feet first to reduce venous congestion and using the anchor chain to fine tune to the speed of descent. Small ascents may relieve a blockage due to the flutter valve effect. Finally, there may be a correctable cause and a visit to your doctor may be useful. How can I tell the difference between inner ear DCI and inner ear barotrauma? This is an important question as the treatments are entirely different. Inner ear DCI requires recompression, but this will worsen inner ear barotrauma. However both may present with dizziness, nystagmus, (eye flicking) nausea, vomiting and unsteadiness. Both are serious conditions and require assessment by a doctor experienced in diving medicine. Inner ear barotrauma is more likely when symptoms begin on compression, with a shallow dive profile and forceful ear clearing. There may be associated ear barotrauma signs and symptoms, such as pain, fullness, unable to clear your ears and red/damaged ear drum. P6 acustimulation effectively decreases postoperative nausea and vomiting in high-risk patients. Electroacupoint stimulation for postoperative nausea and vomiting in patients undergoing supratentorial craniotomy. patients undergoing a laparoscopic cholecystectomy.